It always happens to me. Just as I’m in the middle of wrapping my Christmas gifts, I run out of gift tags. What’s a busy mom to do? I can drop everything and make a quick trip to the stationery store, battle the holiday traffic, spend an inordinate chunk of time at the checkout line, then battle the holiday traffic once again. I think not. Luckily, we digital scrapbookers always have on standby our image-editing software and our stash of digital scrapbooking supplies. 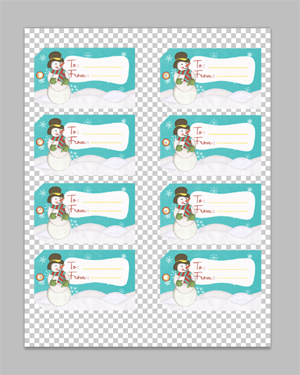 If you haven’t tried making your own gift tags yet, or even if you’re a beginner in digital scrapbooking, this tutorial is super-easy to follow. 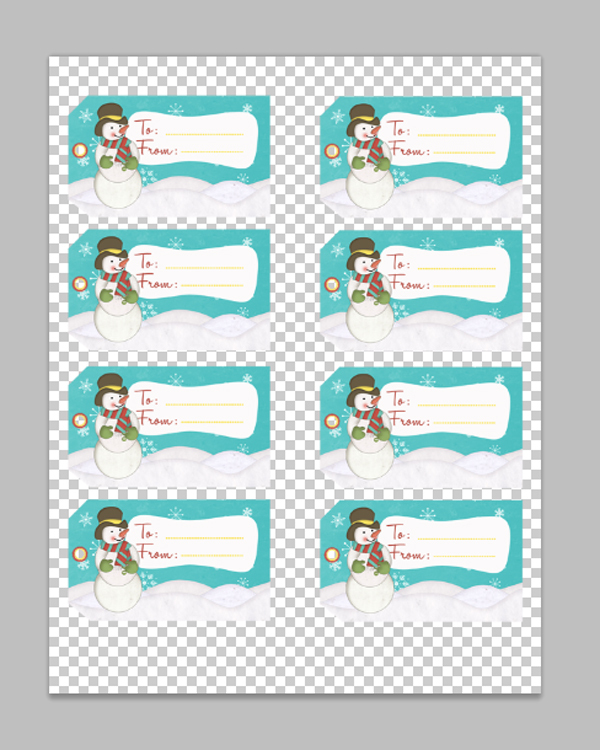 I guarantee that your printable gift tags will be ready in just a few minutes! First, open a new document in your image-editing software. Decide on the shape of tag you want. In my case, I simply used the Rectangular Marquee Tool to make a 3.5 x 2-inch rectangle. Use the rulers in the screen as a guide. Go ahead and click on that tool, and with your left mouse button pressed, drag out your rectangular shape to the desired size. 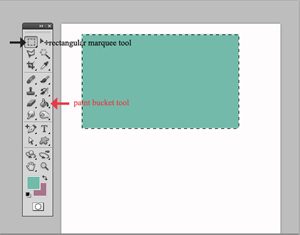 Then fill that shape with any color using the Paint Bucket Tool. Next, choose a background paper as your tag’s base paper. 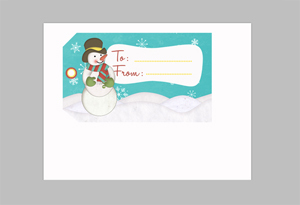 I used a snowy landscape paper from the It’s Christmas! Collection Biggie. 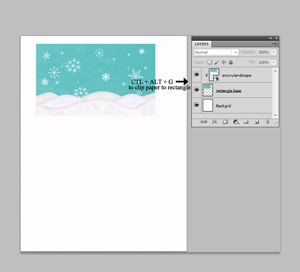 Position your chosen paper directly above the rectangle shape in your Layers Palette (File>Place>ACU_ItsChristmas_SnowyLandscape_Paper) and hit Ctrl+Alt+G (in Photoshop; or Ctrl+G for Photoshop Elements). Now your paper has taken the shape of your rectangle. Move or resize your paper as needed to show off paper details that you like. Next comes the fun part – embellishing your tag! Since we are working on a relatively small area, choose only 1-3 elements so as not to overwhelm your tag. Remember, we’ll be needing space for the To/From section. 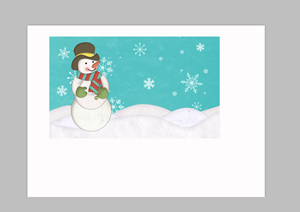 Since my background already has some fun details, I added just one element- a snowman (from the same collection) and positioned it on the tag. Now let’s work on the To/From section. With my Pen Tool, I drew out a whimsical curvy shape to frame my To/From area. If you are not familiar with the Pen Tool yet, you can also use the Rectangular Marquee Tool to draw and fill a more linear shape. Then I just simply typed out the To/From text along with the dotted lines and positioned them over the frame/mat. That’s it! If you want, you can add extra details like dressing up the tag hole or trimming some corners of the tag, like I’ve done here, but essentially, you are done. Save and name your file. To set up your sheet for printing, turn off the white background layer, merge your layers (Layer>Merge visible), and drag the merged layer to a new 8.5 x 11-inch document. In the new document, duplicate your tag to fit as many as possible on the page. Print on medium-weight cardstock. 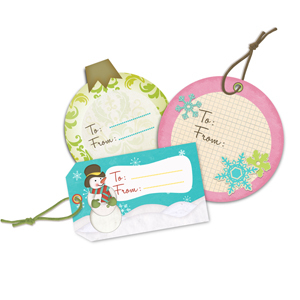 Cut out the tags out with scissors, punch the holes, and tie with ribbons or string. 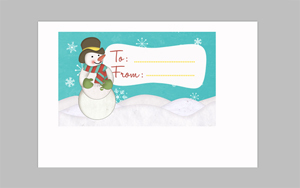 I hope you had fun following this simple tutorial on how to make printable gift tags. Happy Holidays!